Have you been thinking about building a homemade grill? We'll I've got an inspiring story for you to set you on the right foot towards home grilling heaven! I get introduced to some very interesting folks through this site of mine. A while back, I was contacted by a gentleman who has lived for some time in Panama. He's been a grilling lover for years but was unhappy with the gas grill he was using for a while. Rather than buy a charcoal grill like the rest of us, he decided to go all out and build a grill. Not only that, but he designed the thing and built it from scratch! He ended up making a lovely parrilla-styled grill. A parrilla is a South American style grill, particularly prominent in Argentinian cooking. 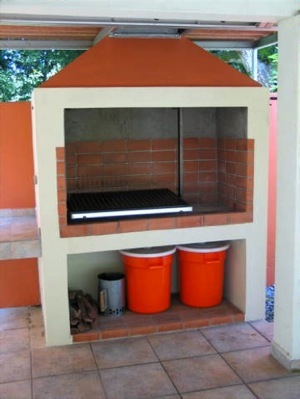 It is basically an open brick fireplace with a grill which can be raised and lowered over the fire. My friend Ken must have some experience with engineering because he designed and built a beauty! I'm quite jealous of this beautiful grill and amazed at the versatility it has. One of the nice things about a homemade grill like this one is that you can use just about any type of fuel source. Charcoal, firewood, smoking woods can all be easily tended in the open-front fireplace grill. And because the grill is adjustable, you can get it to just the right height to keep your cooking temperature right where you want it. 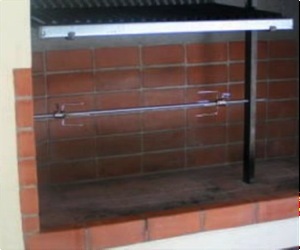 Usually, these adjustable type grills are primarily for direct heat cooking but Ken solved that problem as well. He crafted a big rectangular grill lid with a thermometer that he can place on top of the grill to hold in heat and smoke so that he can even do slow cooking barbeque and smoking on this thing! As if that weren't enough, he can also raise the grill out of the way and attach a motorized rotisserie! Below are his pictures and descriptions of the homemade grill he built. On the next "build a grill" page I even have his original plans he designed and used to build the grill. The fire is usually started and maintained at the right side. When the coals are ready they are spread below the cooking grate at the left, the grilling area. A small amount of coals are kept at the right so that, if needed, extra wood or coals can be added to prepare for later use. Underneath, the two red 30 gal plastic containers are for storing hard and medium hardness charcoal. To the left is a chimney, and an area for storing dried hardwood for smoking and cooking. As you can see there are two cables, located at the center on each side of the grate. 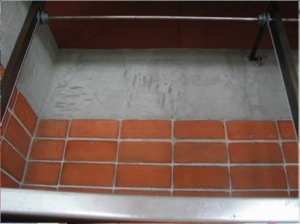 The grate is balanced by 2, 3-inch angle iron guides attached at the center on each side of the grate and run along the sides of the two rectangular beams. 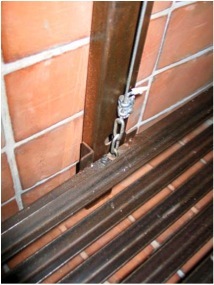 A 3 link chain is welded on the grate at the center and is connected to a cable that runs parallel alongside the rectangular beams. At the top, the cables are attached to pulleys. 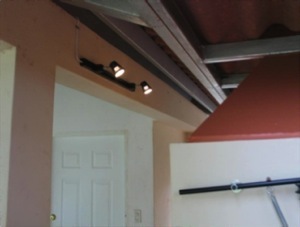 A ½ inch steel bar slides through each pulley and also the rectangular beams. A lockable hand crank on the outside allows you to adjust the height of the cooking grate. One is for the two adjustable overhead lights for evening grilling. Each light can be adjusted to ones liking; one on the cooking grate and the other over the extra wood or coals to the right. The other switch is for the exhaust fan which is located inside the vent at the top. 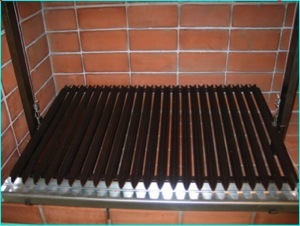 When using the rotisserie, the cooking grate is moved to the top. 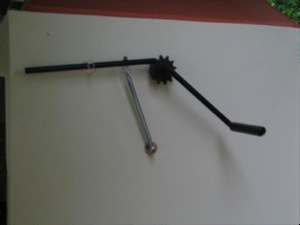 Motor: Stainless steel casing gear rotisserie motor, load weight up to 50 lb test. Bar: Stainless steel 1/2´´diameter x 4 ft length. The bar is 17´´from the bottom. Forks: Stainless steel heavy duty, 4-prong meat forks. 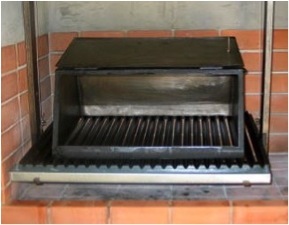 For smoking or indirect cooking, a metal box is positioned on top of the cooking grate. Dimensions: 30´´ length x 20´´ wide x 11´´ height. 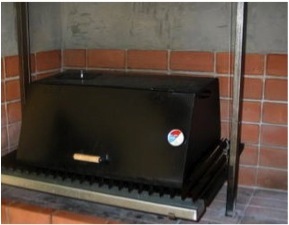 Thanks again to Ken for sharing his beautiful Parrilla homemade grill with us! If you would like to see his original plans for this grill, see the build a grill page. Done with the Homemade Grill page? Return to the Build a Fire Pit section.